The theme of this year’s event is SPACE, in honor of Margaret Hamilton, the Paoli, Indiana native who wrote the code for the Apollo Space Program! Let’s FILL the streets with art! The 1st Annual HeARTland Hustle is a 5k run/walk beginning and ending at Marea Radcliff Park in Paoli, IN. 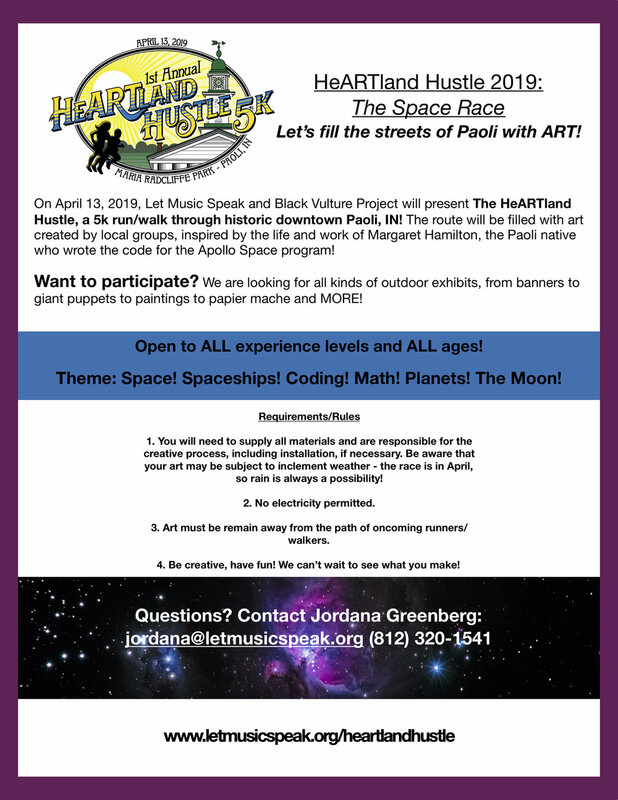 There will be art displayed throughout the 3.1 mile route created by local artists, youth groups, studios and schools, all centered around the theme of SPACE, in honor of Margaret Hamilton, the Paoli native who designed the software for the Apollo Space program. Post-race activities include a health fair in the park, live music and more.